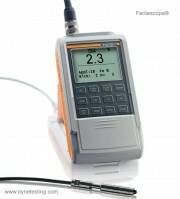 The Feritscope is suited for measurements according to the Basler-Standard and according to DIN EN ISO 17655. Areas of application are onsite measurements, e.g. of austenitic platings as well as weld seams in stainless steel pipes, containers, boilers or other products made of austenitic or duplex steel. 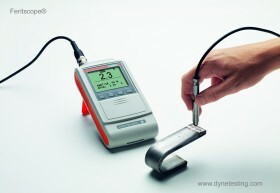 It is easy to measure the ferrite content accurately when using the Feritscope. Upon probe placement on the surface of the specimen, the reading is displayed automatically and stored in the instrument. The probe can also be placed onto hard to reach areas. For such applications, the instrument features an “external start” function to trigger the measurements with the push of a button. This is ideal for measurements in pipes, bore holes or grooves. Measurement influencing factors do not significantly affect the Feritescope. Ferrite content measurements can be carried out regardless of the substrate material properties starting at a plating thickness of 3mm. Calibration standards are traceable to internationally approved TWI secondary standards, which fulfil ISO 8249 and AWS A4.2M requirements. For further information please refer to the Downloads area or contact us for assistance.